Former Sports Illustrated senior writer Hoffer (Something in the Air: American Passion and Defiance in the 1968 Mexico City Olympics, 2009, etc.) turns in a sprawling piece on the “riotous roundelay” that was the battle of three boxers for the world championship. The author locates that competition within brackets of great historical events: the publication of the Pentagon Papers, the fall of Saigon and, in between, Kent State, when, in a curious turn of phrase, he notes that National Guardsmen killed four college students “for no real good reason.” That throwaway phrase is symptomatic, for while Hoffer certainly knows his story and his actors, he infuses it with a know-it-all casualness that can be grating at times. Would Ali, Frazier and Foreman really have been “athletic footnotes” in another era? Not likely: All three were staggering, scary, brilliant fighters, each in his own way, with Ali (whose conversion to Islam, Hoffer writes, might have branded him as a “religious kook” had he not redeemed himself by refusing to serve in the military) blessed with a devastatingly poetic wit atop it all. Hoffer’s sociology is suspect and too often heavy-handed. His account of the actual fighting, though, is immediate and arresting. 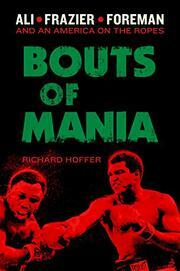 The same holds for his portrait of the swirling sideshow that surrounded the three, with Ali delivering, for instance, “an unrelenting attack on Frazier’s intelligence,” Frazier responding with “classic menace” and Foreman coolly assessing the weird international arenas in which they were thrust. There’s not much here that can’t be found in the grand documentary film When We Were Kings, but Hoffer offers plenty of reasons why we should still remember, and esteem, the lethal trio for more than bucking the draft and hawking stovetop grills. Plimpton or Mailer it isn’t—not even Cosell. Still, fans of the sweet science should enjoy this shaggy yarn of a bygone contest and era.